I’m here on the couch moping with the cat. Where is my storm?? I really wanted it. I am so ready for it. I mean I didn’t buy bread or milk or anything, but mentally I’m ready for it. I’m ready to cancel plans. Ready to not leave the house for the next 48 hours. Ready to not shower, stay in my pjs, and take intermittent naps all day long. I had planned on making my husband feel guilty for not getting firewood. I was looking forward to that all week. Now I got nothing. And it’s almost 40 degrees outside. WTF. I think I just saw a peek of sun. So frustrating. Now I’ll be expected to do things. Empty the dishwasher. Put my contacts in. Get off the couch. This isn’t what America is about! I can’t even depend on weather I was promised. 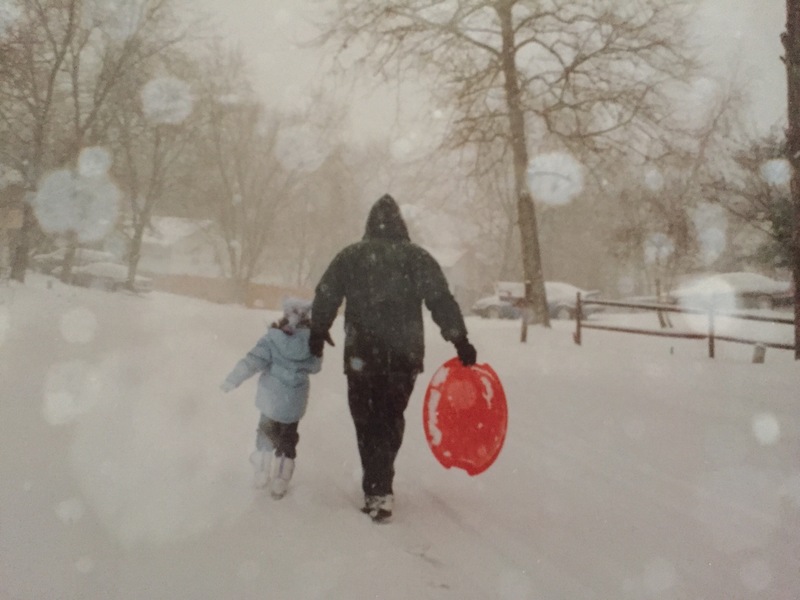 My daughter drove back to school yesterday so she’d beat the storm up in New York. I bet they’ll get a foot. Or two. Pennsylvania, Pennsylvania, you make me sad. I’m not mad at you. Just really disappointed. I think this picture was taken in 2000. We were living in NYC on the upper east side. Kera was 2. 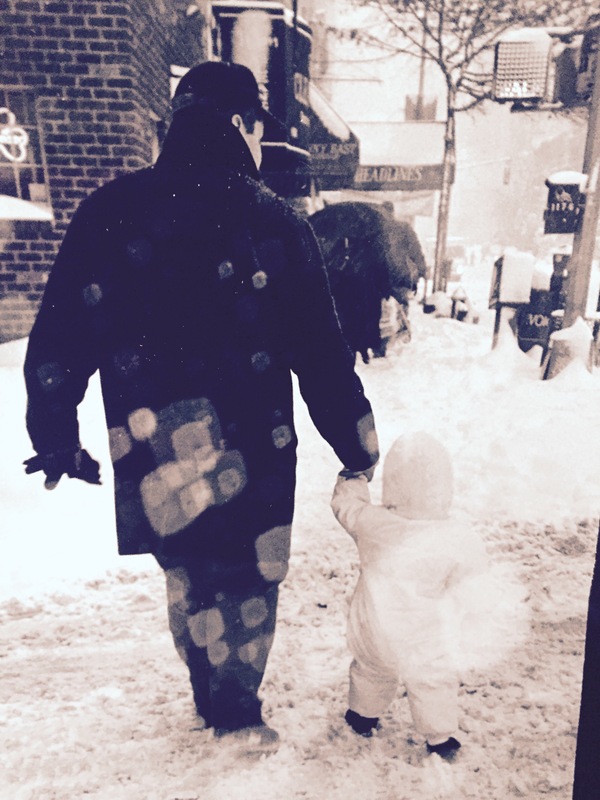 Going for walks with her daddy was one of her favorite things, even in a blizzard. Even in dirty city snow. 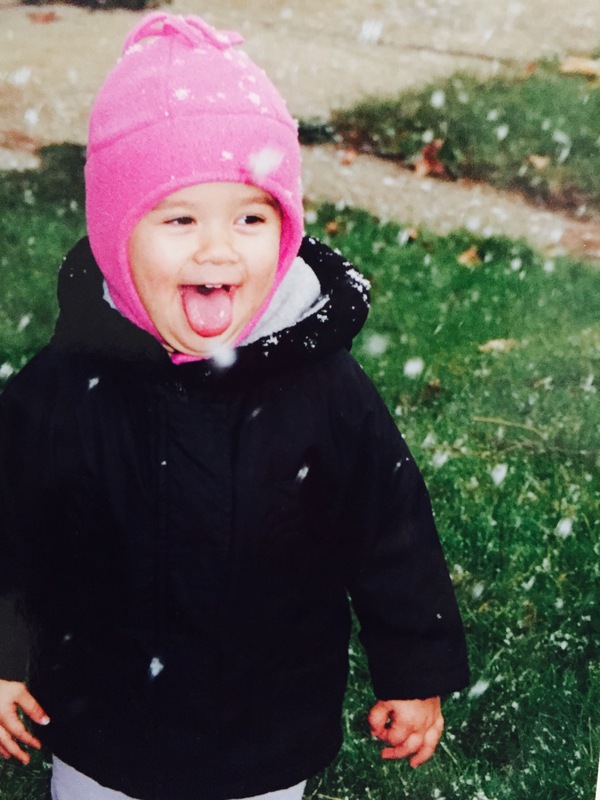 That white snow suit was a gift from her godmother Colleen, my sister-in-law. 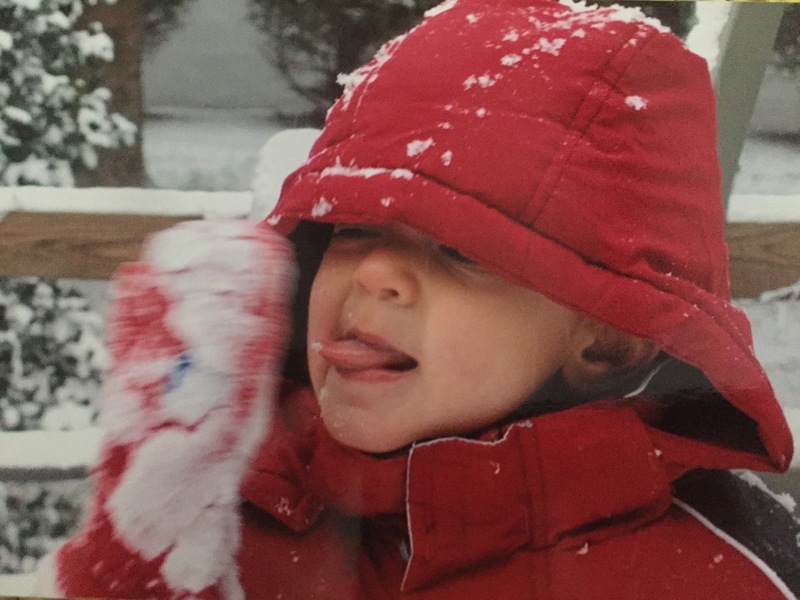 Colleen bought Kera every winter coat until she became a teen – and stopped wearing winter coats. The picture with the pink hat below became our Christmas card that year. 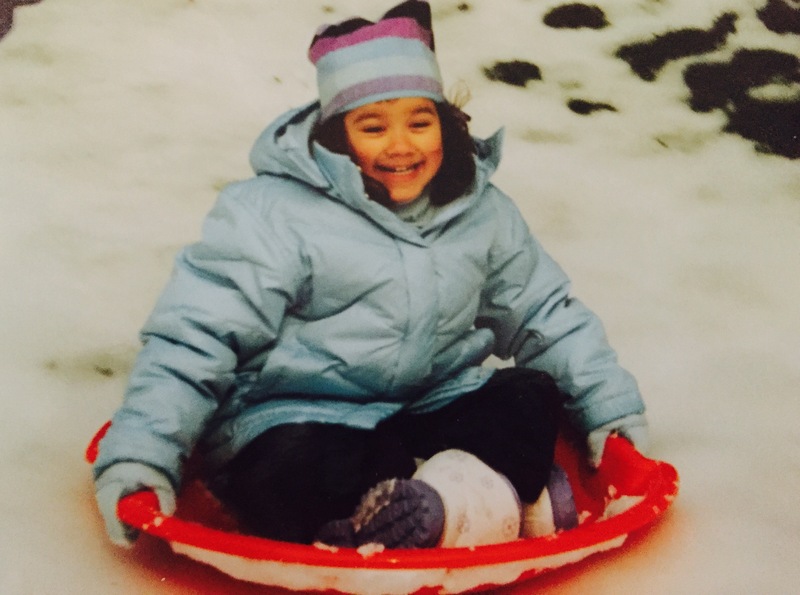 This was Kera’s first major sledding adventure. Look at that face! Look at that hat! Remember when you could put your kids in anything and they’d wear it? I don’t. I think this is that same year. We had moved out of the city to upstate NY. Then Jack came on the scene…ready to party. Just look at Kera’s toothy smile! 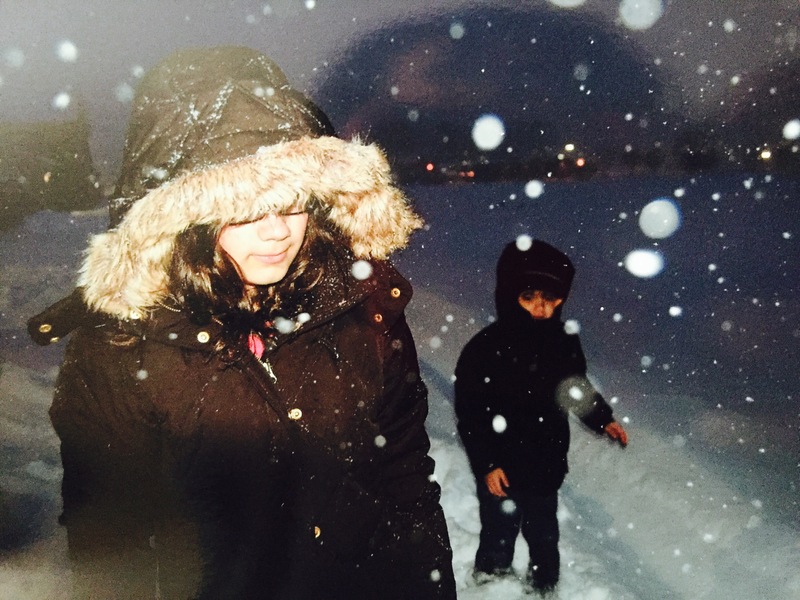 I like taking this trip down winter coat memory lane…. We still meet with family every year right before Christmas – back then we met in Lancaster, PA. Thanks to Aunt Dee Dee we’d see a show, stay in a hotel and kick off the holidays. The picture below is from one of the last times we were there. We drove down and a blizzard hit. The show was cancelled but we found an open restaurant and made the best of it. I’m not sure why Jack isn’t wearing gloves. I seem to have him wrapped up like a babushka except for his little, cold hands. I was too busy taking pictures. Snow makes them happy. And anything that makes them happy is fine by me. We all had a snow day yesterday. Don’t these pictures look like they are black and white? They aren’t . What’s this post about really? I dunno. I took 3 pretty pictures and wanted to share them with you? I’m trying to kill time while waiting in line at the bank? Who knows. I’m off all the week. It’s my transition week. My I-don’t-work-anywhere week. My I’ll-just-sit-here-and-stress week. Why can’t I luxuriate in my freedom and enjoy the days? Why am I imagining every worse-case scenario? Cause that’s how I roll. My brain is like a chicken with its head cut off. The snow storm was a nice diversion from all this free time. It was the perfect amount of snow, just enough to feel like a storm but not so much that we are trapped for days. It started at 7am and ended by 3pm. Then the sun came out. The weather can be so thoughtful sometimes.